For the past 2,000 years, maybe even earlier, the Tuluva people have lived in Tulu-nadu, the coastal kingdom of Alva Kheda, once ruled by the Aupas, referred to in the writings of ancient Roman mariners. The symbol of this kingdom, with twin fishes, is very similar to the ancient fish symbol of the Pandyas. This land stretches south of Goa, across Southern Karnataka to Northern Kerala. It’s a hilly-forested land famous for rice, coconut, areca nut, and wildlife full of wild boars and tigers. This is the land of the Mogavira, Billava, and Bunt communities, of the Yakshagana dance form, of the Koti-Chennaya legend, of serpent-worship known as Nagaradhane and of Bhoota-kolam, spirit dances, meant to invoke bhootas, the mischievous local gods of the land. In Tulu Nadu, one finds even today, special temples, known as ‘sthaans’ where metal and wooden masks of spirits, or Bhootas, are worshipped. It can just be a swing or a platform on the edge of a farm, or in the corner of a house. During special ceremonies, these masks are worn by special dancer-priests-oracles, who then go into a trance. Sometimes, the performers paint their face instead of using masks, and they wear grass skirts, and have a gigantic frame around them, like a sacred nimbus. They hold bells and swords in their hands and swing to the sound of music, all night. In this state, their body becomes a vessel for the deity, and they prove this transformation by performing feats that normal people cannot easily perform, like walking on fire, hook-swinging, and carrying heavy objects. They then receive gifts and sacrifices from devotees such as rice, betel nuts, meat, alcohol, and sometimes even fish, and answer questions that help solve family disputes or provide solutions to inexplicable health and financial problems. The Bhootas are considered the ganas or minions of Shiva and Parvati, who have been sent to earth. 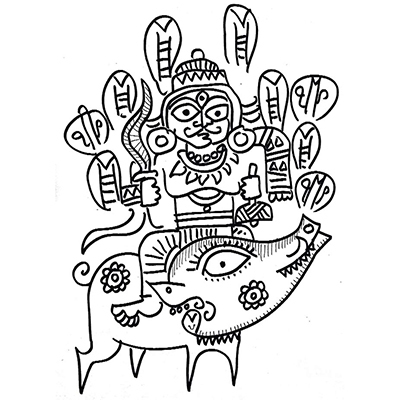 Different Bhootas exists, some in the form of a boar (Panjurli), some in the form of a tiger (Pilichamunda), some in the form of a bull (Nandigona), and some androgynous with a male head and a female body (Jumadi). Most wear cobra-crowns, baring their fangs and sticking out their tongues. The dance is robust and the music raw and elemental. In one story, a female bird gave Shiva an egg as a gift for saving her husband. From the egg came a tiger (Pili), that ate fruits and berries, who was asked to protect Shiva’s cattle but one day it accidentally killed and ate a cow. So, it was told to go to Earth as a bhoota and protect the cattle of the Tuluva people. In another story, while fighting a demon, Shakti became very hungry and so asked Shiva to find her food. All the food he offered her was insufficient and so she swallowed him until only his head stuck out of her mouth. They merged and as Jumadi (corruption of Dhumavati probably), they killed the demon. The boar was Parvati’s pet but it once attacked Shiva’s bull and so Shiva killed it. Later, he revived both the boar and the bull, but he asked them both to go to earth and protect the fields and cattle of the Tuluva people. Like the Mohar-masks of the Kullu valleys of Himachal, or the masked Bon deities of Tibet, or Theyyam of Kerala, or disease masks of Sri Lanka, these masked gods of Tulu-nadu, are part of an ancient heritage that shaped local thought long before Buddhists, Jains and Brahmins organised and categorised it.